Applications are becoming more modular and distributed in nature and hosted on platforms in on-premise data centers, private and public cloud data centers. These applications can run on physical servers, virtual machines or container-based systems. This makes application availability, accessibility, and always delivering consistent and predictable performance more critical for the business and user productivity. So, shifting traffic patterns and distributed applications are challenging IT more than ever before to find ways to maximize application availability, performance and uptime. With shifting traffic patterns, enterprises should leverage broadband to reach these applications more efficiently. On its own, broadband, especially consumer grade broadband, may not offer the best application availability and performance due to excessive packet loss and jitter, which will lead enterprises to experience brownout and blackout conditions. A traditional router-based architecture will not address these challenges. In both blackout and brownout conditions, the user experience, productivity and revenue are negatively impacted. Even though during a brownout the link is not completely down, it is not performing well due to congestion, latency, jitter or packet loss. Traditional routers can’t address these issues as they are not designed to operate above the routing layer. In blackouts, the link goes down driving the need to route traffic over an alternate path. Using BGP is not optimal for this situation either as it can take minutes to reconverge in some cases. A Silver Peak SD-WAN solution takes an application-driven approach to more intelligently manage WAN resources to keep applications running, even during brownouts and blackouts. Long fail-over times – Today, organizations depend on BGP to handle link availability and failover. This approach is not optimal as BGP can take minutes to reroute application traffic. Application performance analysis and fast troubleshooting – Being able to detect and pinpoint the root cause of poor application performance and quickly address the problem can be a daunting task for most organizations. Inability to improve application performance – When the network and applications are impacted due to dropped packets, latency or jitter, IT has to determine the root cause of the problem and manually fix it. Building a cost-effective architecture – Supporting an architecture that delivers high-availability and performance for real-time and critical business applications can be expensive to build and manage. Enhancing user experience – IT needs to become more proactive in ensuring application performance and availability in order to improve the end user experience and support business expectations. With a few simple clicks in the Unity Orchestrator, IT can build multiple virtual WAN overlays for each application or group of applications and apply specific policies to each overlay based on business intent. 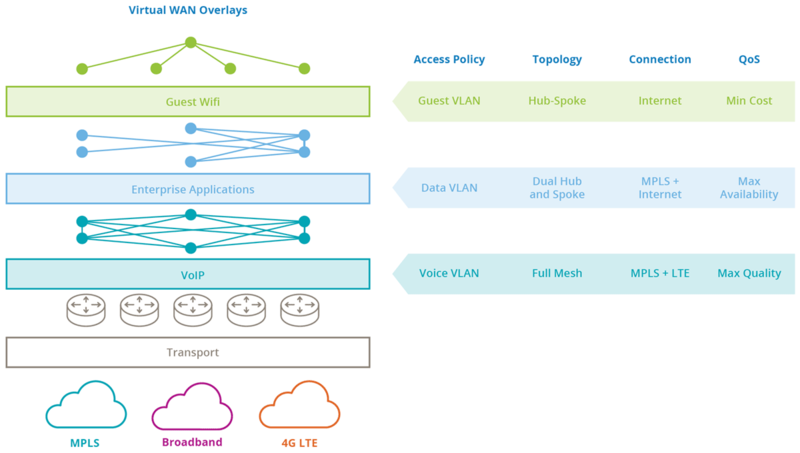 This includes flexibility in configuring the overlay topology (mesh, hub-spoke or dual hub-spoke), access rule policies, connectivity type(s) that matches application and business requirements, QoS parameters, and more to ensure the best performance, availability and user experience, Figure 1. Tunnel bonding combined with configurable FEC (Forward Error Correction) and POC (Packet Order Correction) for correcting for lost and out-of-order packets, ensures that realtime applications like VoIP and video don’t suffer in the presence of congested and poor performing links. Access to cloud-based applications like Office 365 and Salesforce.com is optimized with internet breakout and SaaS optimization. Internet breakout allows direct internet access to applications without backhauling, improving performance and limiting latency issues. For applications that do not go direct to the internet, SaaS optimization monitors physical locations of the applications and continuously updates Internet weather pattern (loss, latency and other metrics) to provide a fast and consistent user experience. With dynamic path control, link failover is achieved in less than a second when using any combination of MPLS, broadband or LTE, links maximizing application availability and uptime, Figure 2. The Silver Peak tunnel bonding feature enables IT to create a virtual overlay tunnel that makes Figure 6: A centralized dashboard for deployments and ongoing operations multiple links operate as a single, larger aggregated connection. Traffic is load-balanced on a packet-by-packet basis and dynamically distributed between paths as the traffic on the network changes, improving application performance, availability and user experience, FIgure 3. Path conditioning automatically improves application performance in brownout conditions (packet loss, congestion, latency) providing higher application performance and reliability, Figure 4. 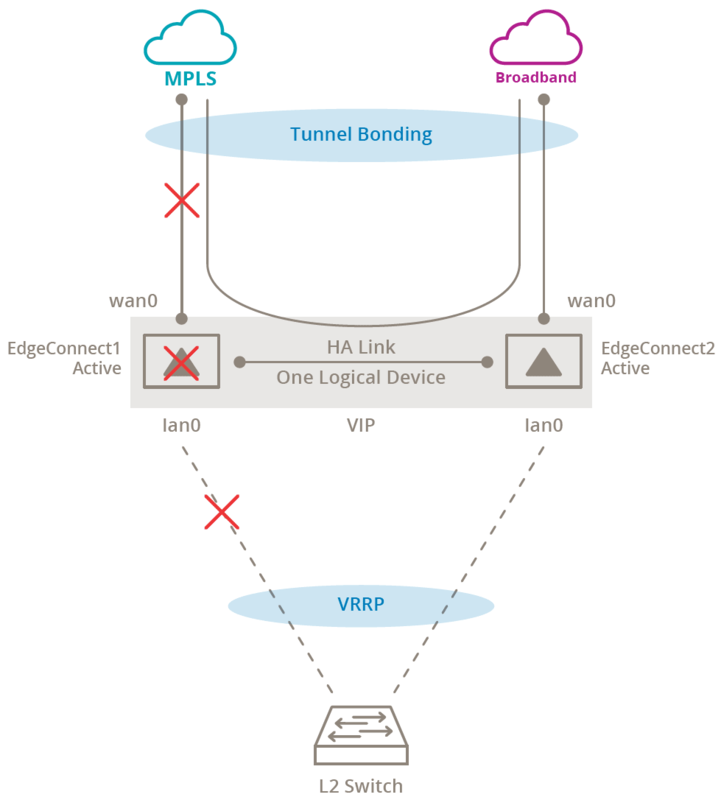 With Silver Peak’s HA cluster feature, two EdgeConnect devices appear as one logical device providing an active-active approach while maintaining the simplicity and redundancy of the SD-WAN. In this model, the application’s availability and performance are strengthened as there is no single point of failure, Figure 5. 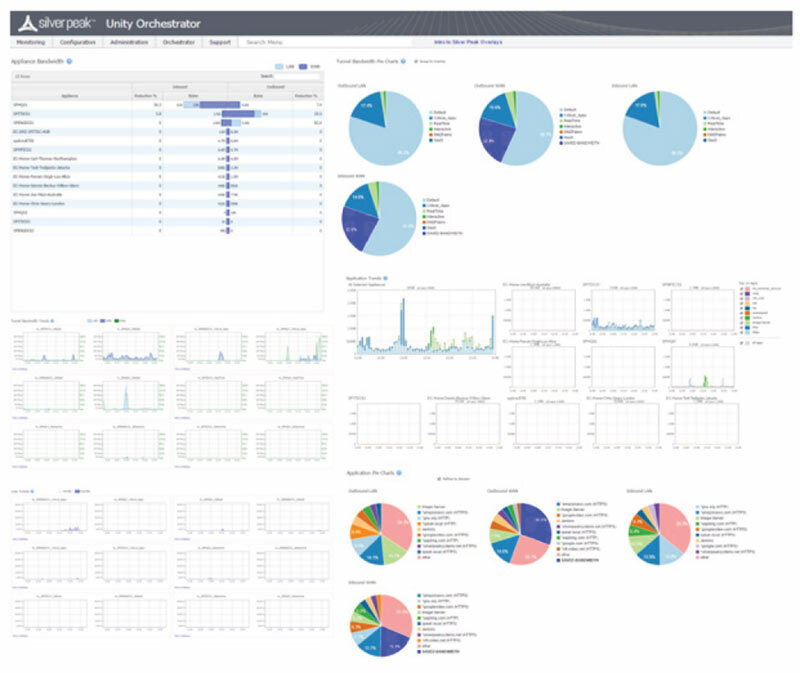 A centralized dashboard provides a point-and-click approach for obtaining real-time data and detailed visibility into all aspects of application delivery across a distributed enterprise, including application performance, WAN performance (latency/loss), Quality of Service (QoS) policies, and bandwidth utilization. In addition, the health map provides a high-level view of the network’s health, based on the filter thresholds configured like packet loss, latency and jitter, Figure 6. 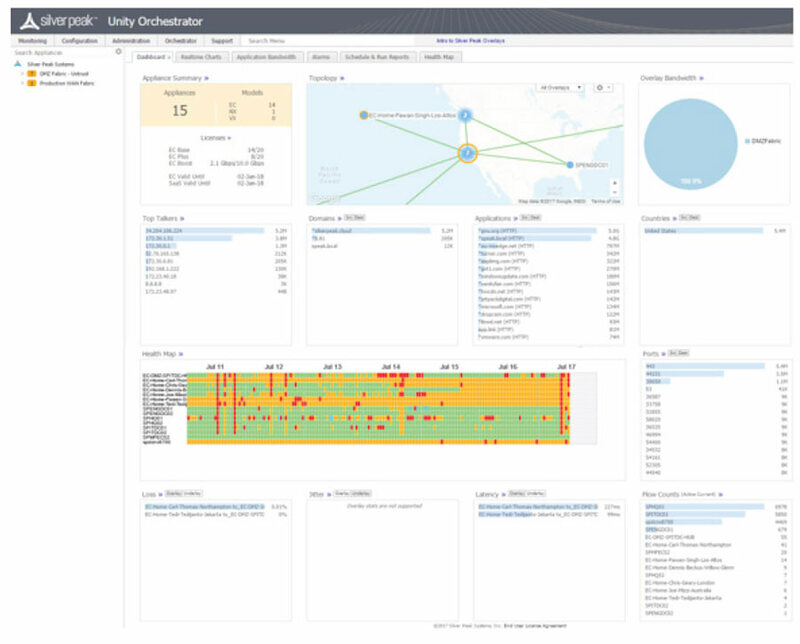 With extensive real-time and historical reporting, Unity Orchestrator provides all the information required for capacity management, network planning, auditing, troubleshooting, ROI analysis, and SLA enforcement, FIgure 7. Figure 7: Extensive reports providing valuable data for troubleshooting, auditing, etc.